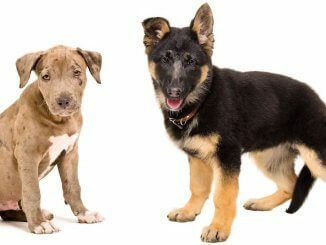 HomeDog BreedsMiniature German Shepherd: Do These Pocket Sized Dogs Exist? A German Shepherd is a bold, intelligent, loyal and active breed. But, what about a Miniature German Shepherd? A Mini German Shepherd will only stand at 15 to 20 inches and weigh a maximum of 50 pounds; compared to the 25 inches and 75 pounds of a full size German Shepherd… not quite pocket-sized, but they do exist! This breeds’ athleticism and petite beauty will attract many dog-parents to them. Though not a purebred dog, this mini cross breed is a German Shepherd Mix with either a Poodle or a Border Collie, creating a combination of a household and working pet. Let us guide you through this breed’s temperament, personality, appearance and care requirements in our owner’s guide. Color Variations Tan with a black saddle, white, black, sable or even black with red or silver. Learn More About This Mini Breed: Download a free copy of our owner’s guide to discover more facts about this designer breed. When it comes to the Miniature German Shepherd, there is more than meets the eye. In fact, a lot of people don’t realise that this breed is not a purebred dog. The common misconception with a Mini German Shepherd is that they are a smaller purebred German Shepherd. However, this is known as dwarfism and is very uncommon. A purebred German Shepherd is usually mated with a smaller breed such as a Miniature Poodle or a Border Collie to create a Mini GSD. The Border Collie and the Miniature Poodle are two breeds renowned for their intelligence, just as the German Shepherd is. However, these breeds are a smaller, medium-sized breed and therefore help create a miniature, fun-sized German Shepherd mix. 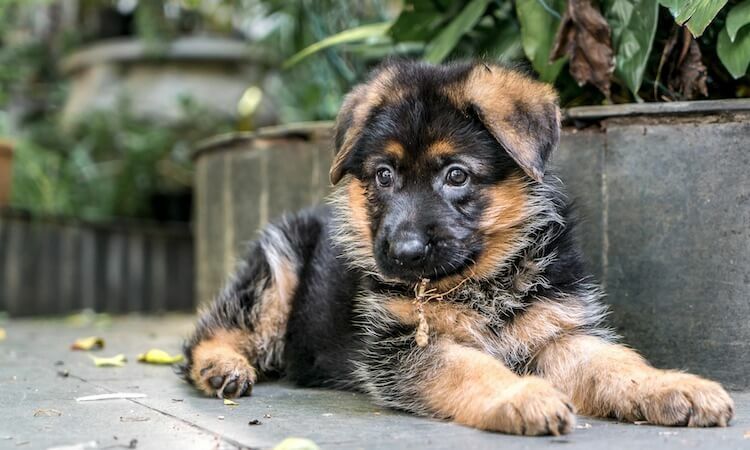 This breed is designed to have all the loveable characteristics of a German Shepherd but in a more compact size. They are suited to be both household pets as well as working dogs. There is no exact date when the miniature German Shepherd appeared in the US. As this breed is not a pure bred dog, every litter will differ significantly. For example, a litter of German Shepherd x Border Collies will differ in appearances to the German Shepherd x Miniature Poodles. With a Shepherd dam (i.e. Mother) each litter will contain about 6 to 8 Miniature German Shepherd Puppies on average; with a typical price of $1000 USD. Loyal, protective, intelligent, athletic and playful; five adjectives which perfectly describe this pocket-sized shepherd breed. The Miniature German Shepherd will love you as much as you let them. They will be happy to provide you with as many licks as your face and feet desire. They may be small but they can be great little guard dogs due to their protective nature. Therefore, the correct socialization is required. Socialization is very important for this mini breed and should begin at an early age (ideally human socialization from seven weeks of age). Be sure to guide them through proper socialization so they don’t get intimidated and protective. Being small, they are full of energy and their playful demeanor makes them the perfect family member if you have children who need to be entertained. As this is a small yet energetic breed, they are suited to a lifestyle where there is a moderate amount of play time or exercise time. They make the perfect hiking partner, running companion as well as cuddle buddy. Yet, although they have a lot of energy, they don’t require a large back yard like their German Shepherd parent. Their more compact and portable size make them easier to home than a full-size GSD. In summary, this dog has a very intelligent and loving temperament. The Mini German Shepherd is a loyal companion suited to an individual or family. Caring for your Miniature Shepherd is definitely not as tiring as caring for other German Shepherd Mixes. They are smaller and more compact and therefore their dietary and exercise requirements are not as high. A breed the size of a Miniature German Shepherd, requires approximately 30 calories per pound of body weight per day. This means that on average, this breed will require 1,500 calories per day. Although this may change in response to many factors such as their age, sexual maturity, size, activity level and season. So this breed will require three cups of dry kibble per day. You should try split these feedings up into multiple daily servings, try feeding your dog once in the morning and again at night. 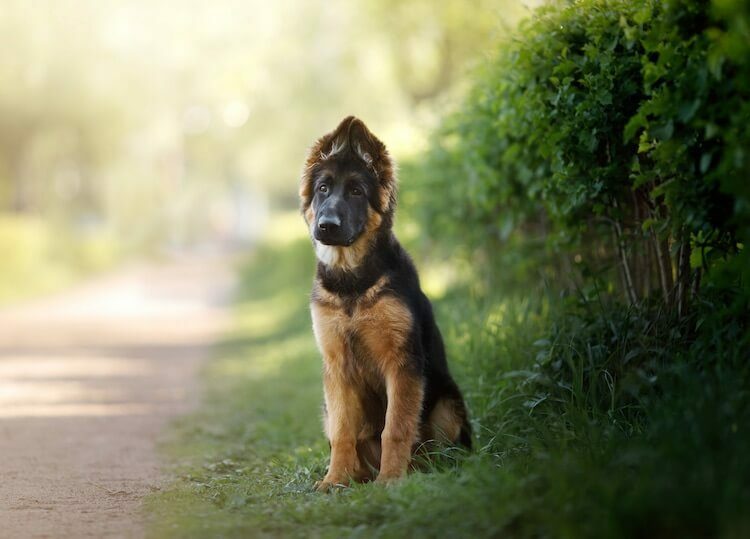 Like other Shepherds, this breed may be prone to hypothyroidism (i.e. low activity thyroid gland) so be sure to make sure their kibble has been fortified with adequate vitamins and minerals. These pups may be small but they are super playful and love activity. It helps provide them with the mental stimulation they require as well. Try taking your dog for a walk at least once a day and then finish off the evening with some play time in your back yard. 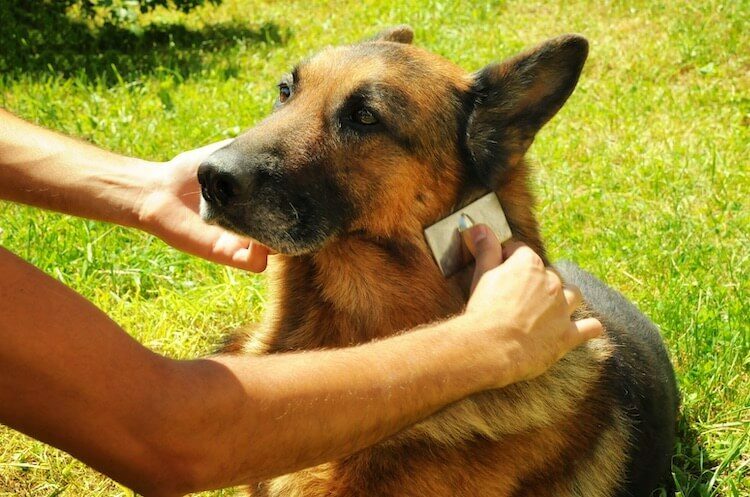 This may take a little time but your GSD should catch on quickly. Even though at the beginning they may be a little cheeky and refuse to give up their new found favorite ball! You can try giving them a healthy treat when they successfully play this game the first few times. If walks get a little boring, try running or even cycling next to your dog. They will appreciate any style of exercise they can get. You should aim for approximately one hour of exercise per day. This will be sufficient to keep you and your pup in shape, fit and active. You are lucky that this Mini GSD is very intelligent and therefore your puppy should learn new commands quickly. Just like their parents, they make excellent students. In fact, your puppy will learn those basic; sit, stay, no commands in no time. Obedience training and household training should be simple and take no time at all, once again making them a perfect family pet. 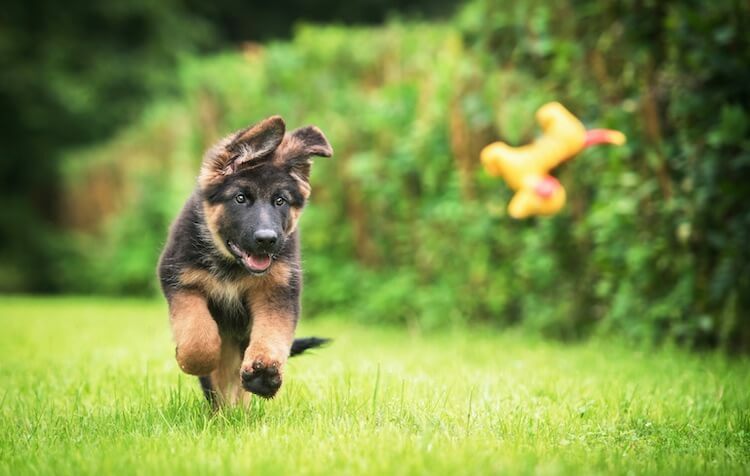 The key to training your puppy is to keep the training simple and consistent. Whilst being fun, be patient and encourage positive behaviors through positive reinforcement training. Mental stimulation is important as it diminishes any unwanted behaviors from arising. Such as boredom which may lead to unwanted chewing and barking in any pup. Begin socialization at an early age and be sure to introduce your pup to changes in environments, new objects and a range of people. Once they are old enough, try out puppy classes and doggy day care so they can befriend fellow canines. Being a smart breed, their brains need to be kept engaged. You can provide stimulation through exercise, training, bonding and games. The German Shepherd is genetically susceptible to Hip Dysplasia meaning that this too may be passed down to your miniature German Shepherd. Hip Dysplasia occurs due to a malformation in the joints of the hip. This may lead to lameness and eventually surgical treatment. Physiotherapy may be provided by your Veterinarian in order to reduce any pain associated with the disease. Unfortunately, ongoing problems may lead to surgery. Unfortunately your Miniature German Shepherd may also suffer from bloat. Bloat occurs when your dog’s stomach overfills from gasses putting pressure on other organs which may lead to severe pain. This disease is dangerous as the pressure can lead to further health issues such as cardiac and respiratory problems. A fully grown German Shepherd will be 25 pounds bigger than a miniature. There is a reason that this breed is called a Miniature German Shepherd. They look exactly like them… although more petite of course. A German Shepherd which will stay half-sized forever. They usually have tan fur with a black saddle. Although their fur may even sometimes be black, sable, white and even a combination of black with red or silver. Their lovely double coat is one of their favorite accessories for the cooler months as it provides them with that extra warmth. Their eyes are brown and their ears are raised on top of their heads (although when they are puppies they tend to lop down). This breed’s build is definitely athletic and bold. They stand at only around 15 to 20 inches and weigh up to 50 pounds; compared to their German Shepherd parent who may weigh over 70 pounds. One thing to remember is that the Mini German Shepherd is not a recognized breed and therefore variation between litters (e.g. size and appearance) may be greater. Brushing your puppy should begin as soon as possible so that they become accustomed to this routine. The grooming requirements of the Miniature German Shepherd are a lot like those of the purebred German Shepherd. Brushing a Mini Shepherd is a necessity, because of their double coat. If you don’t you may just end up with a new found layer of carpet courtesy of your pup. 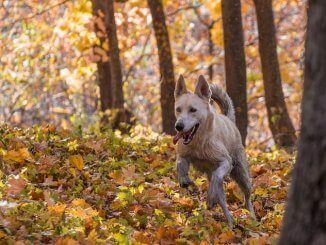 You should brush the coat of your Mini GSD at least twice a week, and this may increase during the warmer months when your pup is getting rid of that extra coat. Blow-outs are also something to keep in mind. These occur twice a year in response to a change in season. So don’t be alarmed when you see your dog losing A LOT of hair during this period. This breed is a cross, and it is not a purebred German Shepherd, therefore these requirements may differ in regards to their fur differences from either the Border Collie or Miniature Poodle. The perfect breed for any German Shepherd lover who doesn’t occupy the space or effort for a regular German Shepherd. This breed may be miniature but their personality remains as bold as their parent breed. 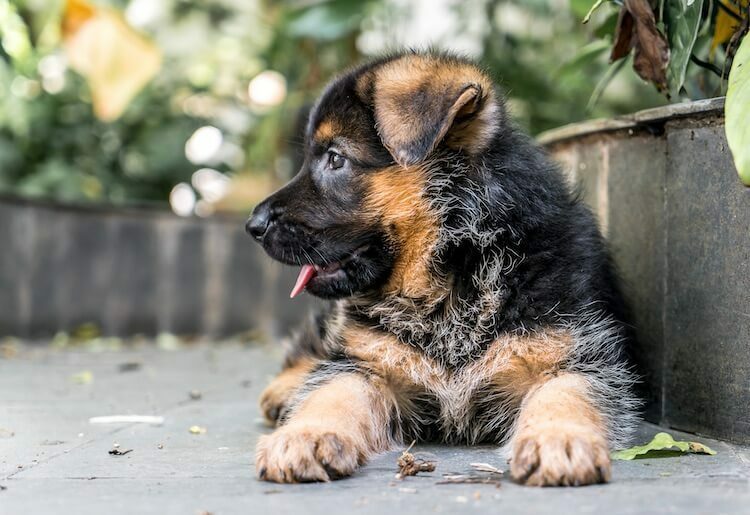 Loyal, intelligent, playful and bold; all the characteristics and beauty of a true Shepherd makes this breed a perfect dog for any family or individual. They are even perfect for children due to their playful demeanor. Training, feeding and exercise requirements are easily met therefore contributing to this breeds growing popularity. So, what do you think? Is this pocket-sized German Shepherd right for you? Let us know in the comments below. 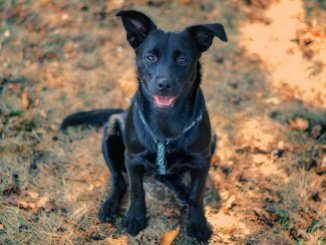 German Shepherd Lab Mix: The World’s Best Family Dog? Oh my goodness it’s so freaking cute! I want one!